If you are experiencing flatulence, taking chicory root extract may help reduce your digestive discomfort. Chicory root is a traditional herbal remedy for digestive problems taken to promote nutrient absorption, reduce bloating and balance gut bacteria. Chicory root extract can be purchased in health food stores or made at home using dried or roasted chicory root to make a herbal tea similar in flavor to coffee. Chicory is not intended to replace medical care, so check with a registered medical herbalist and doctor before purchasing chicory products. Chicory, also known as Cichorium intybus, is related to other medicinal pants commonly in use, such as dandelion and tansy. According to an article published in "Rural Living" in 2011, chicory has been used and cultivated by humans for thousands of years since ancient Egypt. The common name for chicory comes from its old Egyptian name, cichorium. Chicory is used in traditional western herbal medicine as a digestive stimulant, liver tonic and internal cleanser. Chicory root is also popular as a coffee substitute and is added to some beers as a flavoring. Farmers use the leaves of chicory as feed, with its high content of tannins making it useful in inhibiting parasites in farm animals. Chicory root contains dietary fibers called fructans and inulin, which have a beneficial effect on cultures of symbiotic bacteria that live in the small and large intestines of humans. Symbiotic, or "friendly," bacteria such as lactobacillus and bifidobacteria ensure healthy digestion, inhibit pathogens like candida and support immune function. In a study published in "The Journal of Nutrition" in 1998, researchers from the Catholic University of Louvain in Belgium tested fructans and inulin from chicory root in bacterial cultures. Chicory root had a significant effect on bifidobacteria, providing food for the bacteria and enabling cultures to grow faster. Researchers concluded that chicory root and its fructans and inulin are probiotic and will benefit the growth of bifidobacteria in the human gut. Studies have shown that chicory root may promote digestion, but getting the balance is important. According to a study published in "The American Journal for Clinical Nutrition" in 1998, researchers from the University of Copenhagen in Denmark tested the effects of dietary fiber from chicory on the digestion human patients. While up to 5 g of chicory fructans and inulin were well-tolerated, people who ingested between 20 to 30 g per day experienced digestive discomfort involving flatulence, diarrhea and bloating. Researchers concluded that the dietary fibers found in chicory are safe and beneficial for digestive health, especially with their supportive effect on symbiotic bacteria in the gut, ingesting too much chicory root extract may make digestive problems worse, not better. 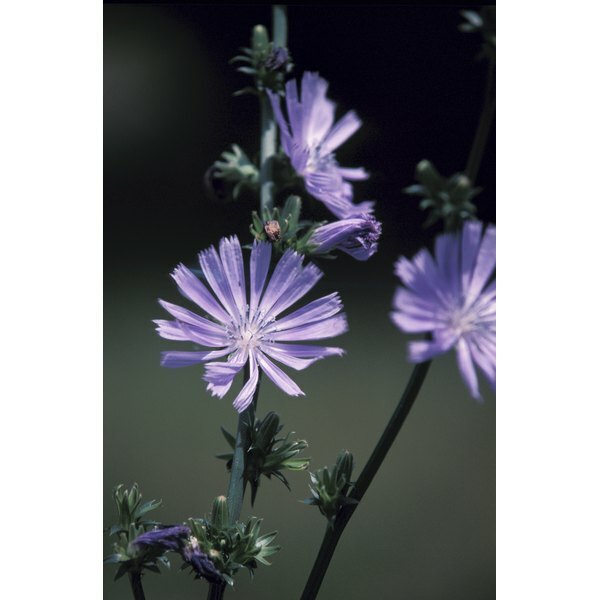 According to Drugs.com, chicory root is safe and well-tolerated by the majority of the population. Some people experience allergies and contact dermatitis when handling the leaves and flowers -- if you have a known allergy to chicory, avoid using chicory root products. When selecting chicory root products, purchase organic chicory root because of reports of contamination with toxic fungicides. Avoid using chicory root during pregnancy and breastfeeding since it has stimulatory effects on menstruation.